This past week has been a mixed bag as far as my fibromyalgia is concerned. Last week was pretty much terrible up until Friday, but last Wednesday I went to see my doctor, got some of my homeopathic meds adjusted, and all is well right now. But that could change in an instant, so I'm not taking a healthy moment for granted. Over the holiday weekend, I got caught up on my marathon training. Between Friday and Sunday I ran 20 miles. I have friends who run 20 miles in a day, but I'm only competing with myself here, and I was happy to accomplish that. Neil was nice enough to run with me most of the time, and having company when you're slogging along in the heat is nice. 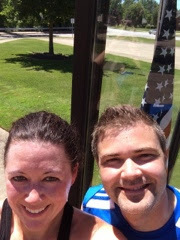 We made a stop on our 4th of July run at the South Euclid War Memorial and took a selfie. No disrespect to the veterans. 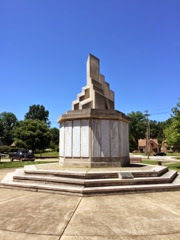 I actually like to run to this monument every 4th as a way to show my respect for the troops. It was a little bit of a downer to see that there's a new section for fallen soldiers from the most recent conflicts in the Middle East. Which is yet another reminder to not take any healthy time for granted. This week has been going pretty well, too. I'm at the 4 month mark for alopecia treatments and my hair is continuing to regrow pretty nicely. Having needles jabbed into my scalp isn't something I particularly enjoy, so I hope to have enough regrowth to end those treatments soon. I read a really amazing top 10 list about dealing with chronic pain, and it really resonated with me - 10 Things I've Learned About Living With Chronic Pain. I'm fortunate to have more good days than bad ones these days, but I can relate to everything the writer says. If you know someone who's suffering from chronic pain, it's worth a read.